Create professional looking buttons for your pages. Is there a better alternative to RAGE ButtonDesign? Is RAGE ButtonDesign really the best app in Author Tools category? Will RAGE ButtonDesign work good on macOS 10.13.4? RAGE ButtonDesign helps to ceate professional looking buttons with mouse over and mouse down transitions is simple. Choose from over 75 included templates, add your unique touch, then export your buttons as standard based Cascading Style Sheets and HTML. 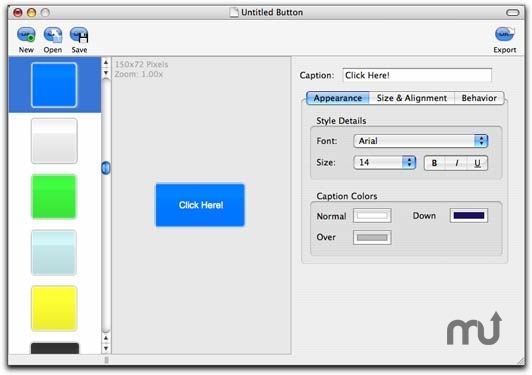 In just three easy steps you can create stunning buttons for your Web site. Create as many buttons as you need for your Web site. Easily update styles and templates in the future as your design changes or your ready for something new. Lets users enter exact dimensions for buttons and fixes problems with CSS buttons in Internet Explorer and fixes other minor issues. RAGE ButtonDesign needs a rating. Be the first to rate this app and get the discussion started!